Any kind of kachori aloo ki subzi makes me weak in the knees and you all know it well how we waited to have a divine taste of this luxury in Haridwar . I was so smitten by the taste that I had to repeat that experience in my own style, low fat style that is. Don't tell me a fried recipe can't be low fat. I say lowest possible fat ...okay ? So when I do such things at home I do it in the lowest possible amount of fat and since frying cannot be substituted with anything for a kachori, the only fatty indulgence of this kachori is a quick swim in hot oil. 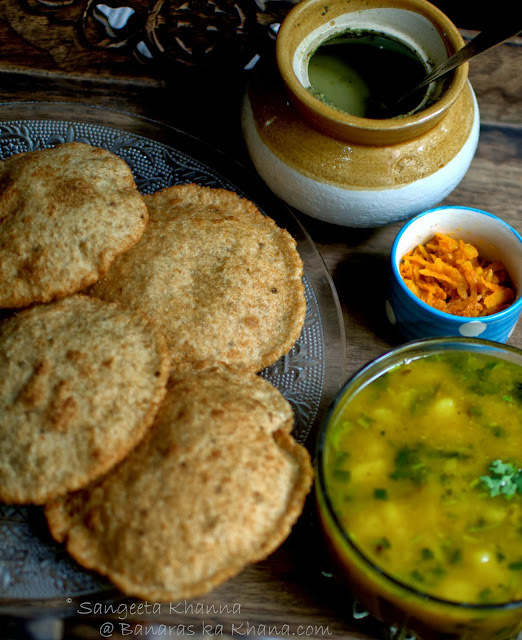 It would be better if you know that a firm dough of whole wheat flour, the kachori stuffed with care so that it doesn't get punctured and a quick microwaving of the kachori before the hot oil swim makes it quite low on fat content, believe me friends !! Make a stiff dough with whole wheat flour with salt to taste and some ajwain seeds thrown in. 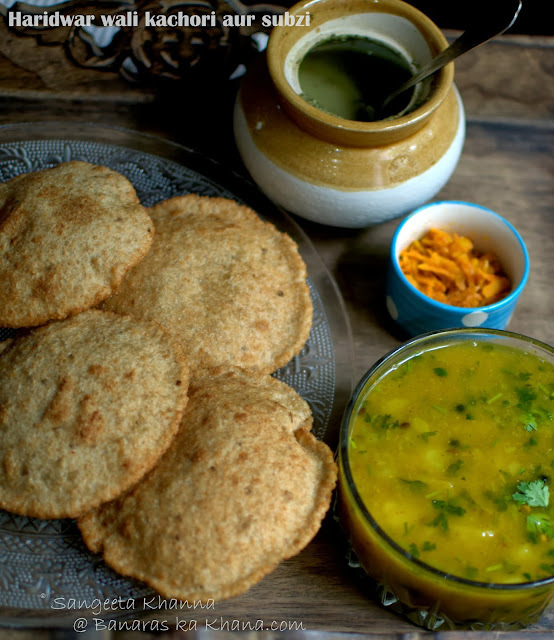 Slightly coarse wheat flour is used for these kachoris. 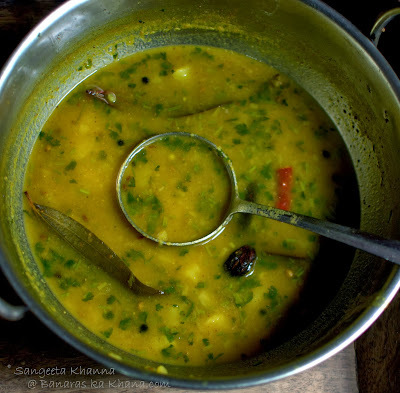 A bowl of soaked mung or urad daal with skin (usually it is husked urad daal)is ground with ginger, green chilies and a bit of garam masala. I microwaved this mung daal paste, stirring it 4-5 times after every minute and the paste becomes the consistency of the dough. In the authentic recipe this paste is fried (bhuno) in oil till it gets brown and dehydrated. dry frying this paste results in a smoky flavor but I preferred a low fat spicy version and gave a miss to the smokiness. A quick tip : do not add any water while making the daal paste and add the seasonings according to your tolerance to heat. Here is how the dough and the stuffing look like. The stiff dough and the paste to show you how they should look to 'complement each other', both should be the same consistency so that the stuffed kachoris do not split or get punctured while frying. Now pinch off small portions of dough , make a bowl of it and place a little daal mixture into it . Now seal the dough , flatten the resulting ball and roll into a thick disk . 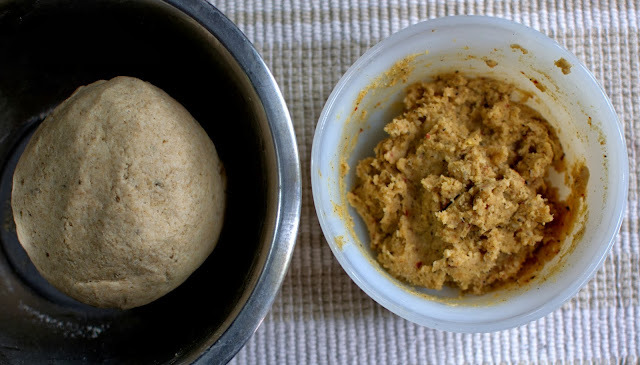 The rolled kachori is first microwaved for a minute before going into hot oil directly, so keep the kadai with oil ready and hot when you start stuffing, rolling and microwaving the kachoris one by one . Do the stuffing and rolling beforehand if you can't handle all the four activities at a time . Microwaving and frying will be easy to handle in the second step. Peel and cube the potatoes, keep aside. Heat oil in a kadai and throw in the asafoetida, followed quickly by all the spices except those typed in bold. You must have noticed that the quantity of the cloves is much more than a normal curry but that was the highlight of the aloo subzi we had there in Haridwar , and that was the reason why i liked this aloo curry so much . feel free to reduce the amount of cloves if it is too much for you , it is a hot spicy curry with very strong notes of cloves. Add the spices typed in bold and quickly add the potatoes mashing them while adding to the pan . Thrash with a spatula and mix well. I added finely chopped green coriander at this point as I was not pouring any green coriander chutney over the kachori aloo like Haridwar . Make chutney if you feel like, I served hemp seeds and coriander greens chutney on the side it this time. Add enough water to cover the mix and some more to make the curry almost watery... or as thin or thick you like it. 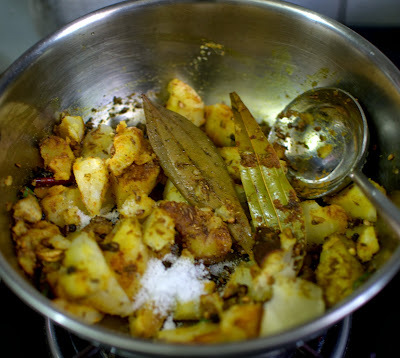 Add salt to taste and let the curry cook on low flame till a nice cloves aroma wafts through the kitchen. The curry is watery, the way I like it. With a gentle aroma of green coriander. The first notes hitting the tongue will be cloves, and the curry will be hot. Very hot but you wont be able to resist second helping I warn you. You could choose to break the kachoris and dunk them into this bowl of aloo curry. We had it served on the side and dunked small pieces of kachori in the aloo curry as we sipped some curry like soup too. This is one addictive aloo subzi to be served with pooris and kachoris, especially for those who love spicy food. Yummy hot way to start a weekend, healthy at the same time. Very nice recipe. Well now I dont have to go to Haridwar. Next time I get the Aroma of Haridwar Kachori , I will land at your place for sure. I liked the spicing and the riot of cloves. The way u have made kachoris cooking them in microwave before frying, reminds me of daal puris that we used to have at home, the puris are either made on tawa (the way we make parathas) or when they are fried they are first cooked on tawa and then fried. Haven't had a kachori in ages Sangeeta. This looks so good. You know, in Indore, aloo ki kachori as well as mattar ki kachori is also famous. Maybe you have had it and would like to recreate that too. :) I will be the first one to comment. Forgot to mention. I have never had kachori with aloo sabzi but I can tell it is a good combination. @ Ushnish ...Just tell me when i have to cook up this riot of cloves next time . I will be delighted. @ Anonymous ... Yes the daal puris were cooked similarly at my place too and and this precooking in the MW is inspired from that. You got it right. @ Suparna ... 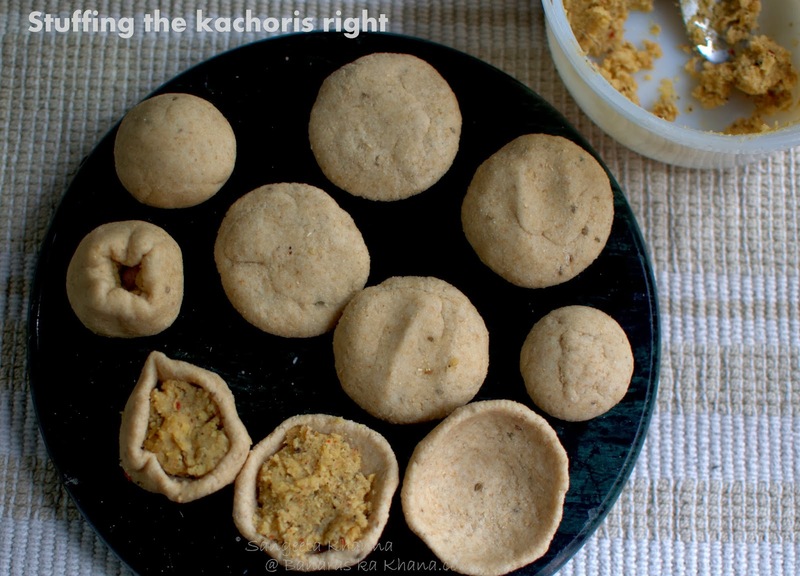 Yes this healthier way to make kachoris can be applied to any kind of kachori . Do let me know when you try. on my menu for this weekend ..
Oh why I am going out this weekend. I so want to have this right now. Loved the pictures on street food....salivated until my keyboard was icky sticky. Will try to make this before I leave ... maybe tomm night...I must I must. Ok enough rambling LOL!!! OMG what a delightful meal! I wish I could eat that right now. It is one of my favorite but I have never made it myself. My grandmother always made it and I remember tasting cloves in it and loved the spicy hot sabzi! This is SOOOOOOOOOOPER!! :) I love it cause Banaras is my native....and most of your recipes remind me of gaon-ka-khana! Sangeeta, since I'm new to cooking, what exactly should I use for everyday curry masala, as you've mentioned in this post? My everyday curry masala has dhaniya/jeera/kaali mirch and tejpatta(scissor cut in strips)in a ratio of 4:2:2:1. All ground together to make a powder, after sun drying or microwaved on the lowest possible power of your MW, to dehydrate them completely. What is 4:2:2:1 is it tea spoon for each ingredients? have been brought up in Hardwar, and I cannot explain how thrilled I am upon getting the recipe. 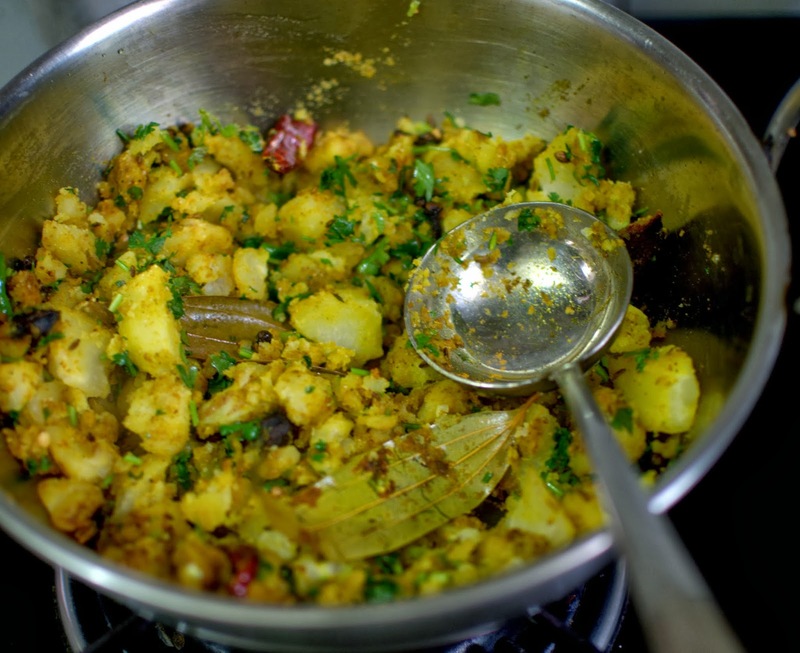 It is very different from the typical Bedmi aloo you get in Delhi. I am surely going to try this one out! Looks delicious!! Please can u let me know the logic behind microwaving the kachoris before deep frying? The logic behind microwaving the kachoris before frying is, that they get cooked and very hot even before you put them in hot oil. This way they need just a quick swim in the hot oil. they puff up instantly within seconds and turn crisp. This way they don't soak any oil or ghee. Hi Sangeeta, do you microwave the kachoris or bake them (in convection mode) before frying? The kachoris are 'microwaved' briefly just so the dough gets partially cooked and heated through, this way the kachori flash fries in hot ghee and semi-cooked dough doesn't absorb fat while frying. It is mircrowave mode not convection. Thanks Chandrika. Hope you tried this recipe. Please aloo ki subji ka procedure hindi mei bta sakte ho plzzz..
Hi Sangeeta. Thank you for this recipe. I'm from Doon and have eaten Haridwar ki kachoree subzi when I was little. Today,out of the blue, I felt like making it after a long gap. So I hit the keyboard and lo and behold, google ji presented your recipe on my laptop, at my kitchen table:) Will be trying it out this week-- have a few friends coming over. Will be using daal wala aata to make basic daal puri, though. I've a feeling I'll be coming back for more of my bachpan ka khana here. Thank you. Hi Sangeeta, can the kachoris be pr-cooked on Tawa too? I do not use microwave. Yes Tawa works fine but take care to not let the pooris get spotted. 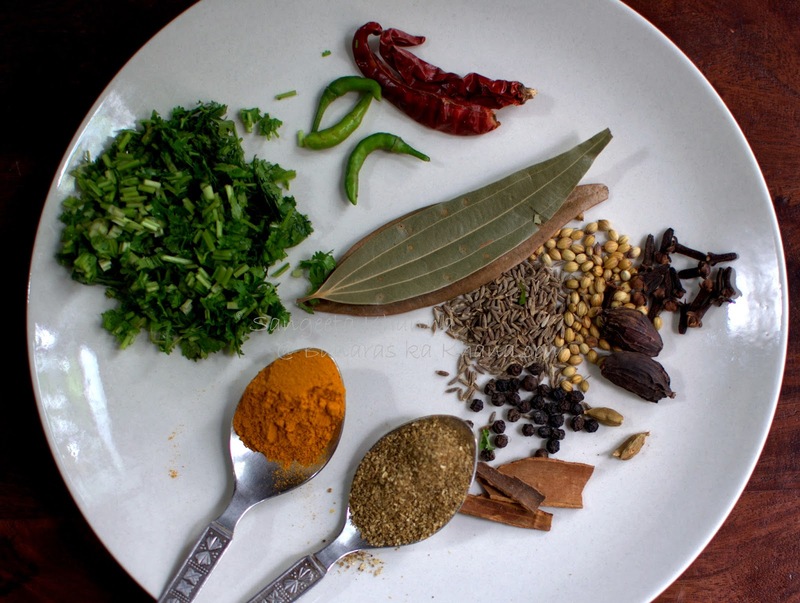 Hi Geetanjali, the everyday curry powder recipe has been posted on this blog earlier, I am linking it to the text above. Please check.